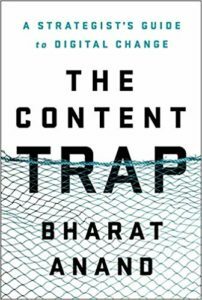 The Premise: The Content Trap: A Strategist’s Guide to Digital Change is written by Harvard Business School Professor of Strategy Bharat Anand. I’ve had the pleasure of sitting in one of Bharat Anand’s lectures, and as I was preparing for the case study on Schibsted, a media company owning some of the largest newspapers in Sweden and Norway, I was scratching my head wondering what possible theory could have launched this company into such extreme success. If you ever have the chance to listen to Bharat Anand, you’ll see that he has a brilliant charm, and that brilliance is reflected throughout the book. Exploring different case studies, like the Scandinavian media giant Schibsted and every industry in-between, Anand narrates and proves how connectivity is more powerful than the protection of your content. I wanted to share this book not only because it was eye-opening, extremely interesting and stunningly factual, but because it truly does call out this revolution in industries today and shares strategies that are transferable across all industries. It digs into deeper meaning and strategies around the leadership behind certain successes. In the book, Anand states that “[s]uccess for flourishing companies comes not from making the best content but from recognizing how content enables customers’ connectivity…[d]igital change means that everyone today can reach and interact with others directly: We are all in the content business.” In a world where we seem to be removing connection, Anand shows how important it is to bring connection back and weight it as heavily as the value that is placed on physical content. It should also be noted that this book has received rave reviews from all the big players and throughout the book, Anand really gives you a bible of tried, tested and proven case studies and laces those stories with cold hard facts and his feedback on how each company’s journey has led to their stand-out success. The Bottom-line: While heavy with fact and content, this is a very readable book that draws connections to the workforce phenomenon we are experiencing today – the trap of content and saturation of information – and shows how it is the power of networks and connection that prevail and prove much more important than the content itself. The information, narratives and examples in the book while may be specific, apply to any and every industry and the challenges that they are facing today. This is a down-right brilliant business book for anyone who likes to learn! Recommendation: If you’re looking for answers and possibly guidance around some of the tumultuous trials of the 21st-century work world, and how to navigate in the content saturated culture, give this brilliant book a read and close the pages feeling relief and enlightenment. The theories that Anand exposes are eye-opening, brilliant, and will change the way you strategize.